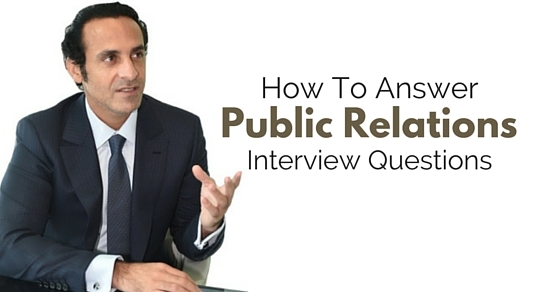 Public Relations Interview Questions – How to Answer Them? I tend to look at public relations as some sort of practise where you have to manage relationships between members of an organization and transmit messages. As per the general terms of public relations definition, it could be a recruiting agency or even a sports team… the key is to know how to communicate in such a way that the level of the organization and brand is maintained. In this post that is exactly what you are going to learn. Those who would like to join the PR industry should definitely take some tips on how to answer questions and prepare for the interview process. 1. Why did you choose public relations as a career choice? You have to be honest while answering this question and say something interesting and unique. If you are extremely passionate about it, mention that in your answer. In that way you can show off the knowledge you possess and the pr skills you have, to be a part of this industry. In case you are not passionate about it, maybe you should not be sitting for that interview at all. Nobody wants to hear boring and sad answers like this was the only job that seemed practical. Each and every one of those panellists that we have spoken to so far have always stressed on having great writing skills! All of them believe that those who write well can easily become a part of this team. For this you need to have good ideas which are articulate and at the same time undeniable. It should be clear and concise. The writing that you have done in the past obviously comes with some proof. Make sure to show them that while answering this question. 3. If you had to balance between objectivity and advocacy, how would you do it? A part of every public relations interview is to promote their organization and make them popular without having to fool people or deceive them. This is a special situation where your honesty counts. You really don’t have to give away every single detail of what this organization is doing but you must always report what is relevant to them with very little bias. If you happen to be a part of some organization, make sure to mention the facts in a very positive manner. 4. How will you begin your day and what will you prioritize on? The question here will help the interviewer understand your working habits. All employers would like to know what kind of tasks should you prioritize on and what should be given more priority. What are the sources that should be looked at initially? Why should they be given importance over anything else? What would you do after that once you have received all the resources? Answering such questions will help your employer know your work tactics and how you would conduct a good research. Be careful of what you say because all of this counts. 5. What sort of skills do you possess that could help a client communicate their message? Now here is a good opportunity that you could use in order to speak about the experiences you have had in the past, what you have learned from them and what you are taking away from all of these. You should be prepared from beforehand with a few examples or even anecdotes about how you have communicated or sent a message to your clients in the past. Talk about your writing skills here and don’t forget to give prime importance to your communication skills, especially if video production and editing skills are your forte. 6. How will you handle a difficult situation or a crisis? People will always have something negative to talk about. They will find something they can rip apart. Sending angry messages and tweets on social media has in fact become very common these days. For example think about the US Airways blunder. Remember that? Yes people will respect you a lot more if you show yourself as someone who is transparent and very honest. It is also good to send apologies so that all issues are clarified. If you have a habit of lashing out, then stop doing that and while answering questions, this is what you should tell. Now there is no correct answer for questions like this. You should be able to give them a thorough explanation and talk about those platforms that are helpful and effective. If you have several favourites, you should focus on those that are very much relevant to the job you are doing now. Always be ready to explain niche platforms which every interviewer might not have an idea about and do so in such a way which is not patronizing and condescending. 8. Tell us how you would speak to a reporter? While answering this question, be careful of what you say. Talk about how friendly and approachable you are as a person and that you possess several personalities, styles and motivations. You would always like to establish a good relationship with the reporter. There are some who could need a bit more prodding than the others. You also have to watch out for those reporters who are known for giving away stories that are false and misleading. While contacting, your skills are highly important. You should always keep in touch through emails and texts. 9. How will you work once put in a team? Now this is one question where you will be judged a lot. It is related directly to the public so you have to be able to nail it with this answer. While answering this question, you should talk about how you have worked with PR teams before, the role that you have played there and how you have contributed towards the team. Also emphasize on the value of every contribution that you make. 10. If you had to manage a press conference, how would you do it? Here, you should talk about how you will put all the information together in a single file for the press. How you will be arranging the venue and the conference. Speak about briefing the reporters, managing the timing of the clients, how you should be checking the statement as well as the information content. You must also arrange the venue for the conference. Do touch up on these points while answering. 11. What sort of skills have you acquired in the past and how would you use that to give the message to your client? A good PR candidate is someone who has amazing written as well as speaking skills. You have to be very persuasive as a person, be able to meet all deadlines and make an impression that will last for long. Experts have often stated that a good professional is one who understands the nature of these humans. They have beautiful intuition and may also be able to articulate their ideas in a way that is clear and concise. What makes this much better is their potential to energize others. The way they speak to others could really change someone’s perception. If the candidate also has great video production and editing skills, it would work even better! 12. How will you be using social media to impress and reach out to others? We all live in an age where social media could either leverage the company or ruin its reputation entirely. Social media is something that goes hand in hand with other media such as print, radio and television. How good can a PR candidate be in promoting themselves on social media? Experts have stated that a good candidate is one who will understand the link between having great content as well as social media. If your recruiter takes a quick look at your twitter page and facebook and finds it unimpressive, why would they even want to hire you in the first place? Your impression matters! 13. How would you define public relations? This is one question that will help the employer know what you understand by the term public relations. Because PR can seriously not be broke down any further, you have to speak about those areas such as crisis, marketing, control or even when it comes to managing online community. If such a question allows the recruiter to understand what your philosophy or understanding is regarding the job, they will know whether they should hire you or not. Every pro should be smart and having good skills will definitely be able to give a new direction to the company. So you must answer the question in a way that makes sense and is impressive. 14. What are you focusing in your company now? If you are asked such a question, then always remember that the recruiter is asking about corporate news or any other which the company is focusing on right now! So what are the new products that they have released? Have they already announced the acquisition of a new start up recently? Have they donated any substantial amount to any charity organizations? Knowing about these things will always impress and let your employer know that you are someone who does their homework on time. If you are feeling brave, then you may discuss how you like to do things inside the company. When you are answering a question, you have to be careful of what you say. Don’t use statements that are too clichéd. Don’t use vague words or come across as someone who is pretending to be over the top. Of course you should not try too hard either. You should be able to answer all questions without any problem and look as confident as you can. In order to be able do that, you have to dress the right way and feel good about yourself! While speaking, you should also remember to have good body language. The way you handle yourself during the conversation is highly important. Your body language should be good for sure and the smile should always be there. Of course that doesn’t mean you have to grin all the time. Just be yourself, look at the recruiter while answering the question and show what a fun loving and cool person you are and why they should want to hire you immediately. Obviously you have some questions in mind for them and it would be great if you could discuss and clarify some of your doubts. In case you have a few doubts and ideas in mind, do let them know for sure. Having questions for them is always going to make the recruiters think that you are interested in the job. But don’t ever ruin it with asking the wrong question. Ask those that make sense and will help you understand the job better. Apart from that, you should simply follow the other tips given above! If you follow all the pr tips and ideas enlisted in this, you will definitely be able to land a good careers in public relations or PR job. Plus the public relations salary will be like around forty thousand us dollars on an average per year even if it is just an entry level opportunity. Literally every opportunity that comes to you in the form of public relation careers should never be taken for granted. If you are getting something like this, take it immediately. Just remember that doing a good job in the interview also needs skill, so practice enough before you go.